How to generate large area Raman maps quickly with unique features from Renishaw Raman. 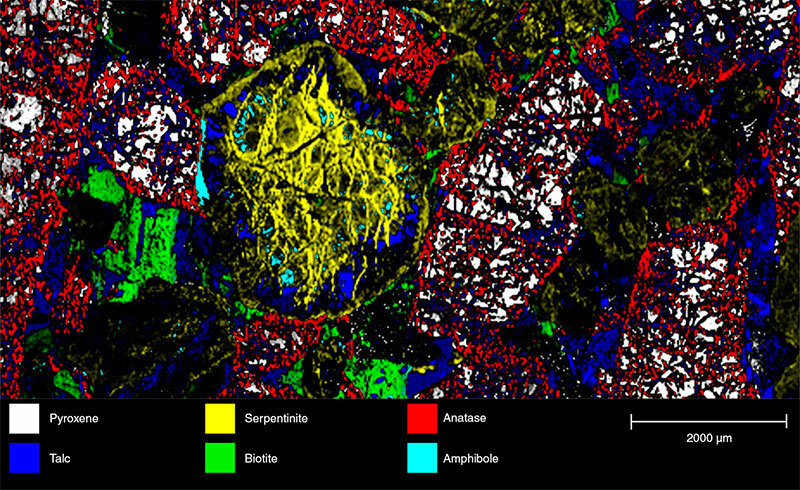 Analyse large areas quickly, without sample damage and at high resolution. Blue Scientific is the official distributor for Renishaw Raman in the Nordic region (Norway, Finland, Iceland, Sweden & Finland). If you have any questions, please get in touch. Pharmaceutical tablet for treating Parkinson’s disease (click to enlarge). Contains two APIs (yellow=levodopa, red=benserazid) and four excipients (green=anhydrous citric acid, cyan=maize starch, pink=magnesium stearate, blue=microcrystalline cellulose). Instead of an intense laser spot that can damage the sample, it uses a line of light. This is much gentler and eliminates sample damage. 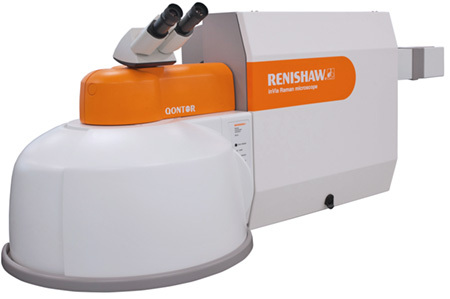 StreamLine is a feature of Renishaw’s InVia Raman microscope. Samples are rarely completely homogenous. It’s important to collect information about how their various components are distributed. With StreamLine you can collect data about their size and distribution, even from large area samples. 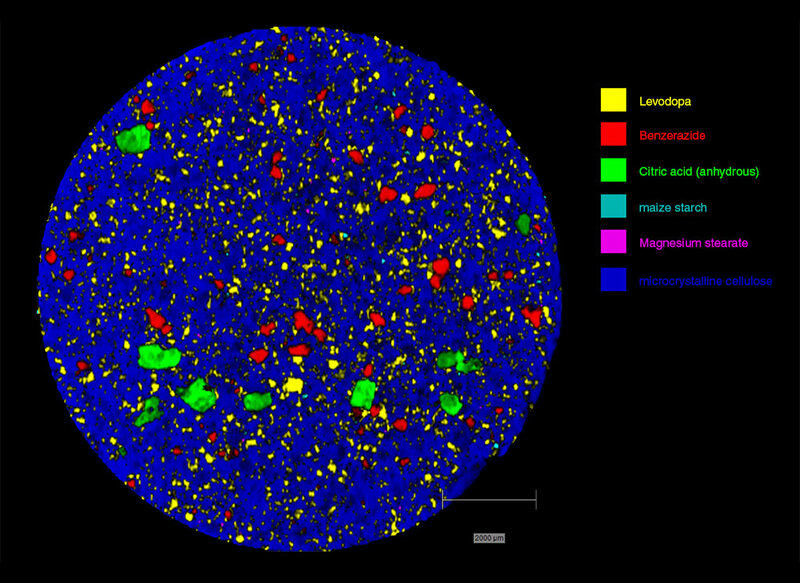 Polished igneous rock section (click to enlarge) showing the variety of mineral species over a large area (6mm x 5mm). Accurate sample movement is important in large area mapping. A High Speed Encoded Stage (HSES) is available to ensure precise, controlled motion that’s synchronised perfectly with the signal and detector for high quality results. This ensures that the laser line passes each imaging point on the sample once, and the signal is immediately read by the detector. This set-up makes it possible to quickly acquire large, artefact-free chemical images. Unlike maps made up of smaller, tiled images, there are no artefacts and the data is much more accurate and reliable. The motorised stage has a step size of 100 nm and a range of travel of 112mm x 76mm. Optical encoders track the stage’s position during motorised and manual control. After positioning the stage manually, it can be finetuned using a trackball or with the software, and there’s no need to recalibrate after sample loading. The imaging area is not limited by the field of view of the microscope; it can be as large as the total travel of the sample stage. There is no need for tiling, which can result in artefacts and innaccuracies. You can adjust the resolution and scanning area easily by modifying the step size or microscope objective. Raman image of crystal domains in a polycrystalline photovoltaic (PV) cell. The size and shape of these domains is related to cell efficiency. Acquired from a commercial PV module through the encapsulation layer, demonstrating the ability to image large areas. When you need quick results and it’s not important to have the highest resolution, Slalom mode is available for even faster scanning. This gives you fast scanning at reduced resolution, while still covering the whole sample area of large samples. The same objective lens can be used for both modes (Streamline and the faster Slalom mode). This consistency makes it easier to compare images of different resolutions. The analysis depth remains the same. It’s also convenient to be able to modify the resolution and size, without having to change the lens. Undersampling is a way of analysing large areas faster, but it can miss small details. With Renishaw’s Slalom mode, the laser line zigzags to ensure the entire sample area is covered without missing any small features. You can be sure that the images are an exact representation of the sample, with all details included. 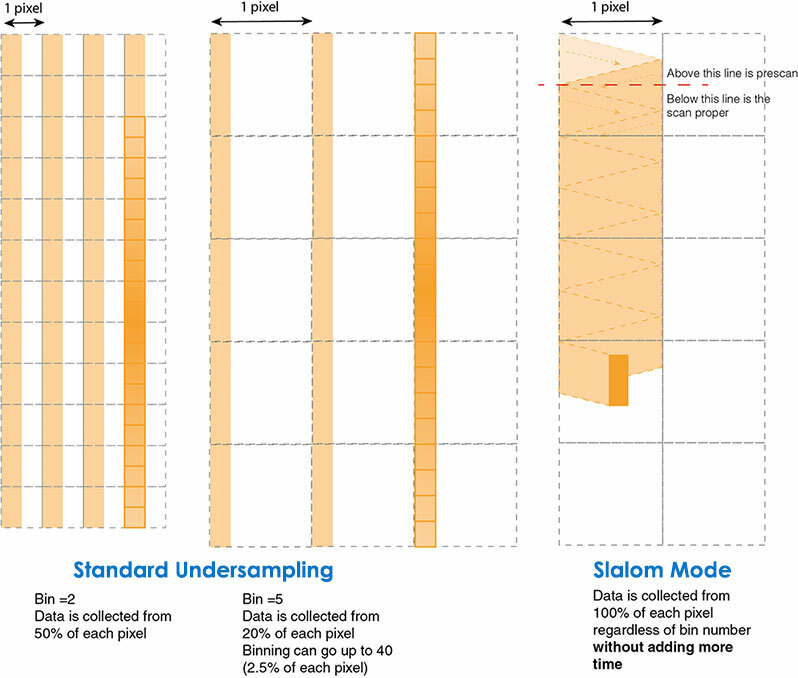 Spot size and step size are important sampling parameters. The best ratio for image quality is equal spot and step size. This covers the entire surface with no overlaps. With undersampling, the step size is larger than the laser spot. This speeds up the process, but leaves out points that are not analysed. Renishaw’s Slalom mode gives you the best of both worlds: fast mapping, while covering the entire area without missing anything out, so you can be sure that the data fully represents your sample. When you need speed and high resolution, StreamHR mode images rapidly with a resolution limited only by the inherent diffraction limit of light. This is ideal for samples with very small features such as 2D materials and graphene.